Lasiognathus dinema is a northern Gulf of Mexico anglerfish species found by Drs. Theodore Pietsch and Tracey Sutton in the Deepwater Horizon oil spill. • sources of nutritious food. Scientific relevancy becomes far more dominant than adornment, entertainment, nutrition, and recreation whenever a fish models unanticipated behavior, navigates uncommon niches, and offers unexpected features. Unabashed, unaccustomed, unfamiliar, unorthodox, untypical, and unusual definitely count as appropriate descriptions of the anglerfish in general and the Gulf of Mexico’s northerly species in particular. Like the other five species in the genus, the northwest Caribbean Sea anglerfish Lasiognatus dinema (hairy jaw, two threads) does not get rave reviews for good looks or taste. Sustainable breeding and feeding instead explain Mexican Gulf anglerfish significance. Professor Pietsch discovered his 2nd Lasiognathus anglerfish, Lasiognathus amphirhamphus, in the eastern North Atlantic off Madeira in 2005.
pelagic zone of waters upward from the near-bottom. lower midnight to hadal trenches. The midnight zone more formally is called the bathyal or deep-sea zone, from the Greek word βαθύς (bathýs, deep). Theodore Pietsch, Ph.D. University of Washington, CC BY 2.0, via EurekAlert! reproducing after far smaller-sized males chew through their future mate’s sides to become progressively parasites, protrusions, and reproductive organs ready for generating offspring according to hostess motives and opportunities. Dr. Tracey T. Sutton, Nova Southeastern University. the northwest Atlantic’s and southeast Atlantic’s and Pacific’s Lasiognathus intermedius. 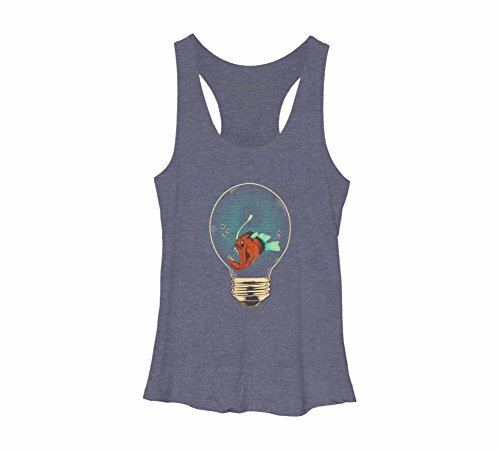 Anglerfish bulb racerback tank top by barmalizer ~ Also available as Men's Crew Sweatshirt, Pullover Hoodie, T Shirt! Agencies/Canadajournal. 6 August 2015. “Scary Looking Fish: Researchers Discover a New Deep-sea Fish Species ‘Photo’.” Canada Journal > Science. Retrieved August 2015. Bald, Linsey. 6 August 2015. “Scary-looking Deep-sea Fish is the Stuff of Nightmares: New ‘Freak’ Fish Found. Examiner > News/Top News. Retrieved August 2015. Behrens, Tom. 6 August 2015. “Lasiognathus Dinema – What?” Texas Fish & Game Publishing. Retrieved August 2015. Bellotto, Adam. 6 August 2015. “Scary Looking Fish: Deep Sea Anglerfish Species Discovered Lurking in the Gulf of Mexico.” Starpulse > News. Retrieved August 2015. Bradley, Gloria. 6 August 2015. “New Fish Species Discovered in the Northern Gulf of Mexico.” NYC Today. Retrieved August 2015. Brown, Amy. 6 August 2015. “Scary-looking Deep-sea Fish: New Scary Looking Deep-sea Fish Discovered by Scientists.” The Cubic Lane > Technology & Science. Retrieved August 2015. Brumfield, Ben. 6 August 2015. “New, Scary Anglerfish Discovered in Ocean’s Dark Depths – Video.” Las Vegas Review-Journal > News > Science. Retrieved August 2015. Brumfield, Ben. 6 August 2015. “New Scary-looking Fish Species Comes from the Ocean’s Dark Depths.” Cable News Network, Turner Broadcasting System, Inc . Retrieved August 2015. Carley, Lauren; Ellington, Jessie; and Turvey, Michael. 2010. “Ceratioid Anglerfish Mating: Sexual Dimorphism and Parasitism.” Reed College > Biology Department. Retrieved August 2015. “Ceratioid Anglerfish: Bizarre New Species Found in Gulf of Mexico.” SportSmasher > Standard Nonsense > 6 August 2015. Retrieved August 2015. Cordeiro, Monivette. 6 August 2015. “Florida Researcher Helps Discover New Bizarre Species of Angler Fish.” Orlando Weekly > Bloggytown. Retrieved August 2015. Coy, Jeff. 6 August 2015. “Scientists Find New Deep Sea Anglerfish Species.” Sentinel Republic. Retrieved August 2015. Donzelli, Joe. 5 August 2015. “Nova Southeastern University Researcher Discovers a New Deep-sea Fish Species: New Anglerfish Discovered During Ongoing Research in the Gulf of Mexico.” Nova Southeastern University > NSU News Room. Retrieved August 2015. Fleshler, David. 5 August 2015. “NSU Scientist Discovers Ugly New Species of Fish.” Sun Sentine > local Newsl. Retrieved August 2015. James, Jelani. 6 August 2015. “Scarylooking Deep-sea Fish Discovered by Researchers.” Headlines & Global News. Retrieved August 2015. Lang, Ian. 6 August 2015. “New Anglerfish is so Ugly, Only a Mother Could Love It.” Nature World Report. Retrieved August 2015. “Lasiognathus dinema: Scientists Discover New Anglergish Species.” Sci-News.com > Biology > 6 August 2015. Retrieved August 2015. Lennox, Sean. 6 August 2015. “Scary-looking Deep-sea Fish Found.” eCanadaNow > curiosity. Retrieved August 2015. Main, Douglas. 6 August 2015. “Bizarre New Anglerfish Species Found in Deep Sea.” Newsweek > Tech & Science. Retrieved August 2015. Millner, Jack. 6 August 2015. “Looks Really Don’t Run in the Family! Strange New Deep-sea Anglerfish Discovered – And It’s just as Grotesque as Its Cousins.” Daily Mail > Latest Headlines > Science > Pictures. Retrieved August 2015. “New Deep-sea Fish Found: Scary Looking Fish.” Associated Post United States America > World News > 6 August 2015. Retrieved August 2015. “New Fish Discovered.” The Monitor > News > Apnews > 6 August 2015. Retrieved August 2015. Newcomb, Alyssa. 6 August 2015. “Scary Looking Deep Sea Fish Discovered in ‘Midnight Zone’ of Ocean.” Yahoo – ABC News Network. Retrieved August 2015. Nova Southeastern University. 5 August 2015. “Researchers Discover a New Deep-sea Fish Species.” Phys.org > Biology > Plants & Animals. Retrieved August 2015. “NSU Researcher Discovers New Species of Fish.” CBS Local Media > CBS Miami > 5 August 2015. Retrieved August 2015. Orfanides, Effie. 6 August 2015. 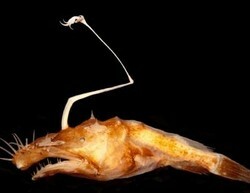 “Scary Looking Fish: New Deep-sea Anglerfish Discovered in Gulf of Mexico [Photo].” The Inquisitr > Animal News. Retrieved August 2015. Pietsch, Theodore. “Ceratioid Anglerfish.” The Palm Beach Post. Retrieved August 2015. Pietsch, Theodore. “Lasiognathus regan (Image) Nova Southeastern University.” Eurekalert! > Multimedia. Retrieved August 2015. Pietsch, Theodore W. 2009. 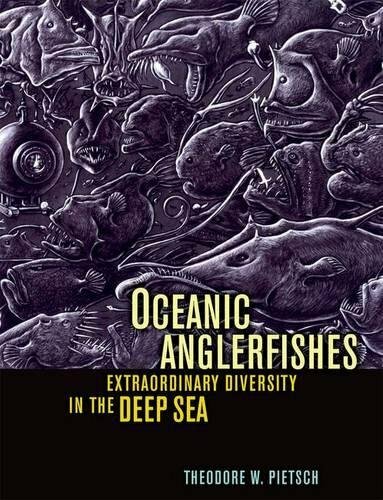 Oceanic Anglerfishes: Extraordinary Diversity in the Deep-sea. Berkeley and Los Angeles, CA, U.S.A.: University of California Press. Pietsch, Theodore W.; and Sutton, Tracey T. July 2015. “A New Species of the Ceratioid Anglerfish Genus Lasiognathus Regan (Lophiiformes: Oneirodidae) from the Northern Gulf of Mexico.” Copeia Published by The American Society of Ichthyologists and Herpetologists 103(2):429-432. “Researchers Identify New Species of Deep-sea Ceratioid Anglerfish.” University Herald > 6 August 2015. Retrieved August 2015. “Scary-looking Deep-sea Fish is the Stuff of Nightmares: New ‘Freak’ Fish Found.” usaonlinepost > Last News > 06-08-2015. Retrieved August 2015. SciNews. 5 August 2015. “Lasiognathus dinema – New Species of Anglerfish.” YouTube. Retrieved August 2015. Toh, Michelle. 6 August 2015. “A New Fish Species is Lighting up the Ocean’s ‘Midnight zone’.” The Christian Science Monitor > Science. Retrieved August 2015. Tyler, Chris. 6 August 2015. “Scary-looking Deep-sea Fish Found (PHOTO).” DbTechNo powered by Theme junkie > science. Retrieved August 2015. Sunlight illuminates lingering oil slick off Mississippi Delta on May 24, 2010, four days after explosion on April 20th on Deepwater Horizon offshore oil platform about 50 miles southeast of Mississippi River delta (28.74°N, 88.39°W). 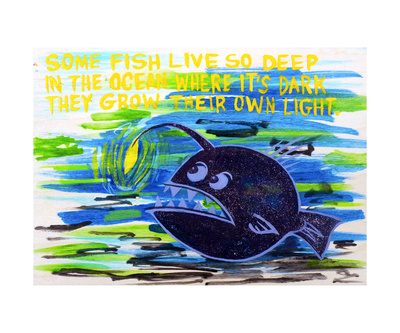 Haiku: Some fish live so deep in the ocean where it's dark they grow their own light. 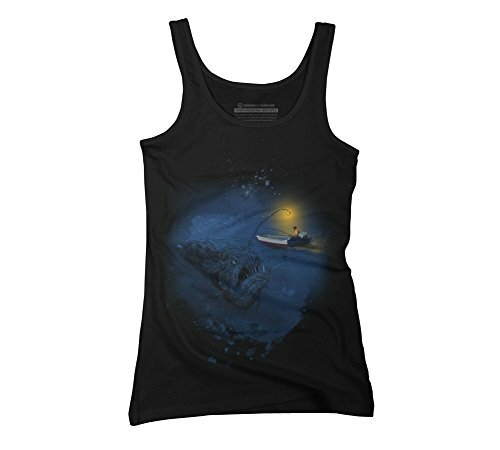 The Angler fish is a black cozy ring spun cotton tank top designed by proboots for Design By Humans ~ Also available as Men's Crew Sweatshirt, Graphic Tank Top, Pullover Hoodie, Zip Hoodie! CruiseReady, If you ever do encounter this fish while you're snorkeling, you'll know that you aren't imagining things and you'll know what it is! It's an incredible bit of ecological and paleontological luck to be funded to study the horrors of oil spills and to find a new species. That is one ugly fish, and unlike anything I've seen in my snorkeling adventures. Guess I'm not likely ever to do so, given that they wouldn't come near the surface. Interesting about how the discovery took place. blackspanielgallery, Yes, they certainly are. In this case, the environment makes me imagine what a fish could look like if water flows on Mars. Strange creatures are always interesting. There are two kinds of ring-tailed cardinalfish. One can be said to be born and die with a ringed tail. The other gets a ringed tail as a rite of passage into adulthood. Devils Hole Pupfish (Cyprinodon diabolis): Will Endangered Resilient Prehistoric Species Survive? The latest count for Devils Hole Pupfish (Cyprinodon diabolis) is an all-time dismal low of 35. Is this endangered but resilient prehistoric species on the verge of extinction?